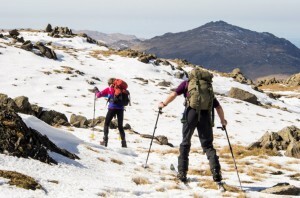 The Lake District Ski Club is run on a totally voluntary basis with all the running, servicing and maintenance being carried out by the members. Members usually meet at Greenside Mines about 10 am ready to start the walk up to the slope. Non-members are welcome to join, and will be shown the route up when members are available. The daily charge for use of the clubs facilities is £10.00 per day. Snow boarders are welcome. Many have commented on the excellent riding. Membership is available. Please contact a club member on the mountain or e-mail us at the address below for details. Members are requested to attend work meets. Two major work meets take place, one in May and one in November. These are done over the weekends when fencing and other items have to be removed and stored in the spring, and replaced in the autumn ready for the season. Work is also done throughout the summer, with painting and general maintenance being done.